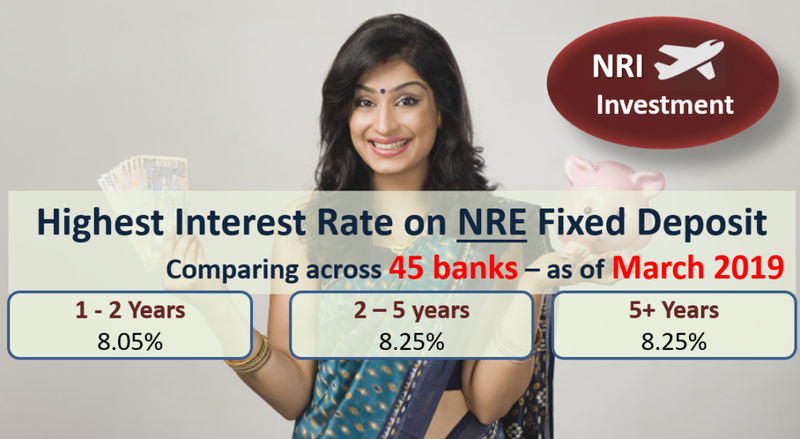 This post compares the best interest rates on NRE FDs. The table below compares the interest rates offered on various NRE fixed and recurring deposits along with the penalty on pre-closure of FD/RD across 45 major banks in India. The highest interest rate on fixed deposit is offered by Deutsche Bank (5 Years) and IDFC Bank (731 days) at 8.25%. IDFC First Bank, DCB Bank, The Ratnakar Bank, Lakshmi Vilas Bank and Tamilnad Mercantile Bank offer highest interest rate across most tenures. RBI on September 2015 had granted licence to 10 Small Finance Banks. Lately these banks have been in news for offering higher interest rates on their fixed deposits as compared to regular banks. 1. The minimum tenure for NRE FD/RD is 1 year (as per RBI Directives from July 17, 2003). 2. The maximum deposit tenure offered by most banks is 10 years. 3. The interest earned on NRE FD is tax free in India but it can be taxed in country of your residence. For e.g. USA taxes worldwide income and hence NRIs from USA may have to pay tax in USA. 4. NRE Fixed Deposit makes excellent investment opportunity for NRIs from lower or NO income tax countries like UAE, Singapore, etc. Also Read: NRE Vs NRO – Which is the right account for NRIs? 5. The principal and interest from NRE FD/RD is freely repatriable. 6. Most banks offer higher interest rate on lower deposit amount (less than Rs 50 lakhs/1 crore). It makes sense to split your FD in multiple smaller FDs to get the highest interest rate. 7. There is NO additional interest for Senior Citizens or bank staff for NRE deposits. 8. Premature closure of FD/RD is permitted for with some penalty on the interest (usually 1% lower interest than applicable rates). Some banks waive off this penalty. However there would be NO interest in case the NRE deposit remained invested for less than 1 year. 10. Only funds from overseas income (in foreign currency) can be deposited for NRE FD/RD account. The amount is converted to Indian Rupee on deposit. Yes its safe… deposit in bank which is easily accessible to you. It’s interesting to see IDFC Bank offering an interest rate of 8.25%. Thanks Amit for sharing all the statistics. For Suryoday Small Finance Bank, interest rate of 9.5% p.a. is for 950 days as special tenures, not 3 years. Thank you so much for the update. I have made changes in the post! I believe the interest rate will be revised soon by RBI and the people who can wait for some time will see more good levels in near future…hope for the best..thanks for you really sincere efforts for compiling this useful information..